To design and build a Giant Kitkat as a birthday cake for our housemate (it’s his favourite chocolate and what more can you hope to receive on your birthday than a pimped version of your favourite snack). Melt 400g of chocolate, pour into the only tupperware we have and cool in the freezer. 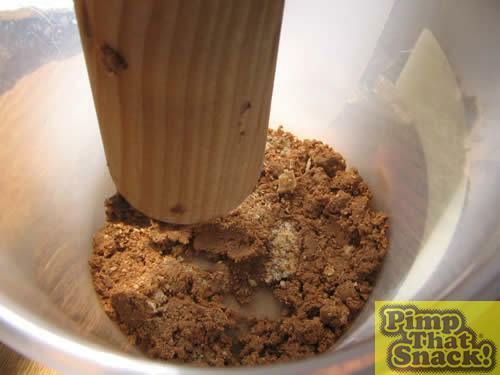 After much debate and careful dissection of the humble Kitkat we decided that the filling is mashed Kitkat, so the glue was prepared by bashing 18 Kitkats with a rolling pin. Once the base was set we tried to lay the wafers out to form the four fingered Kitkat, but due to size constraints we had to design the novel and highly sort after three fingered version. Two layers of three and a half wafers were placed in three rows and sandwiched together using the Kitkat filling. 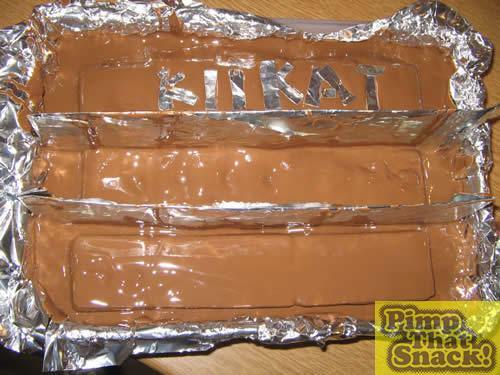 The layers were built up following this method and then cardboard covered in tinfoil was placed between the fingers to keep them separate when the chocolate coating was added. 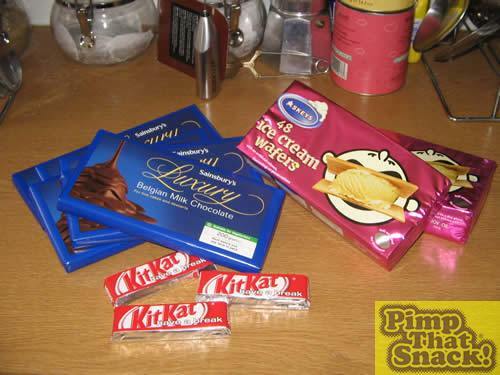 The chocolate was added (after a quick trip to Sainsburys to buy more) and while it was still runny we spelt Kitkat in tinfoil and stuck it to the top of one finger.